MP3.com gets sued for My.Mp3.com. RIAA's open letter to MP3.com. MP3.com's response to the RIAA. MP3.com, which generally toes the line with the recording industry has done something a little subversive. They've created an app which will look at the ID of a CD loading into your computer and make all of its tracks immediately available to you via streaming MP3 off their servers. So, if I "beam" up my CD collection at home, it'll be available (through MP3.com) at work. Try out MP3.com's most recent subversion to intellectual property rights. Pretty neat, all you need to do now is have everyone share a username and password to get access to everyone's CDs. I may weep: Fragment of a Greek Tragedy. 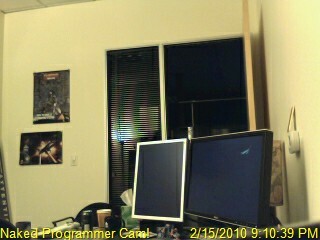 OK, I rewrote the camera from a Microsoft sample in order to get rid of the irritating "Supervision Cam" banner. Also, it no longer hogs my CPU all the time. Another irritation is the web server (IIS) our company uses (and hence serves my website) keeps the most recent webcam file served up open for longer than it should. This means that if someone looks at the webcam page, I can't update the image for some unknown period of time later. Why, Microsoft, why? Neato retro-future signs and toys from Futurama. Yes, that's crazy-mummanshantz-head Craig. I'm waving but my arm was cropped. Can you imagine the uproar if Microsoft did this for their sites? Oh. Wait. Christohper Alexander (of A Pattern Language fame) expects the web to abolish boring housing in the years to come. Just as we can go into a store and have a computer custom-built to our specifications, Alexander foresees a time when we can go to the Internet for information that will allow us to build custom dwellings. "My organization is about to put out a Web site to help people do this on a massive scale," he said. "The essence of this Web site is to create a means for millions of people to do their own thing." Naked Programmer Cam is on its own page as well. I fixed the Y2K glitches on the TotemBar to the left. Woo. hoo. Naked Programmer Cam is now updated every 30 seconds or so for your voyeristic pleasure. Am I at my desk? Now you know. The Orb of Hotep wasn't feeling very well (edits weren't working corrctly) but it should be glowing nicely now. Here it is: Naked Programmer Cam! I'm back from vacation. Many thanks to the hosts and everyone who showed; I think it was a record year. It was really great to see everyone. So, hiring practices in the Capital District are kinder and gentler. "If someone stays in town, you may get him back," explained John C. Haller, one of MapInfo's founders. "If he goes to California, he's gone forever." I wonder how he figured that out?